How diverse is the acceptance of Mutual Funds in India? After its launch in 1964, Mutual Funds have grown to manage assets over 17.37 lakh crores (as on Jan 31, 2017). This impressive growth is because of a strong Indian economy, better regulation, entry of reputed Indian and Foreign Asset Managers, and increasing acceptance of Mutual Funds as a preferred asset class amongst Indian investors. 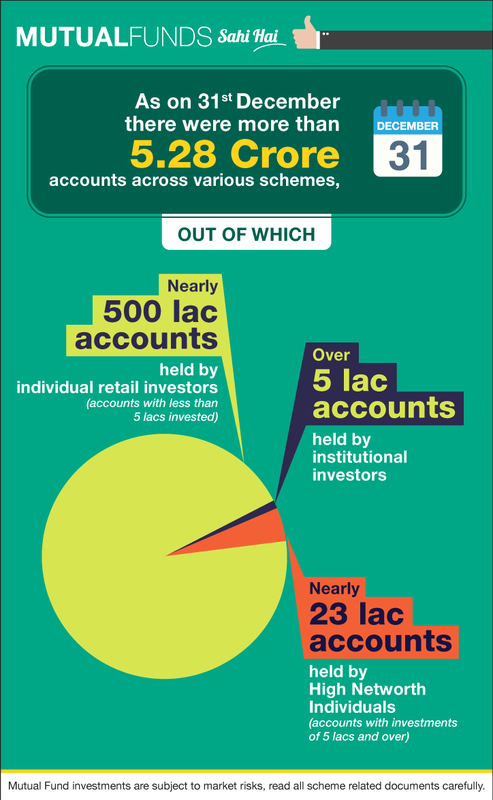 It is interesting to note that the average investment in every individual retail investor account is ₹ 68,086, indicating the acceptance of this asset class by the growing Indian middle class. India today has 42 Asset Management Companies (AMC) that help increase awareness and aid in spreading the message of Mutual Funds and financial planning to an increasingly aspirational country. Nearly 4000 crores is invested every month by way of Systematic Investment Plans, another indicator of the trust and popularity of Mutual Funds in India. The Top 15 cities of India have 83% of total Mutual Fund Assets. The industry is making serious efforts to broaden the awareness and acceptance of Mutual Funds in smaller cities and towns of India. (All data provided by Association of Mutual Funds of India).